1. Configure the London router AUX port to accept asynchronous connections. 2. Issue a show line command to determine what line number has been associated with the AUX port. This lab will use line 65 for purposes of example. You must use whatever line your router has associated. 3. There are several ways to configure the modem. This lab will use a function called reverse telnet. a. First you need to enable the vty passwords to allow telnet access. b. Configure a loopback interface so that the router has at least one active interface. c. Reverse telnet uses the port number 2000 + the AUX line number. So if the AUX port is associated with line 65, the reverse telnet port number would be 2065. This should open a reverse telnet session and establish communication with the modem. You should be prompted for a password. Type the password cisco, a session should begin with the modem. NOTE: You will not receive a prompt from the modem. 4. Type the modem command: AT If you are communicating with the modem, it should respond with an OK.
5. Modems can use different command sets but some of the following are fairly standard for most modems. 6. After modem is configured with above parameters, suspend the reverse telnet session. 7. On the host, go to HyperTerminal and select the modem from the Connect To window. Enter the number of the ADTRAN POTS port (Your instructor will give you this number). NOTE: The most common mistake at this point is to dial yourself – this will end in a busy signal. Ensure you enter the phone number of the other modem.  Configure an ISDN router to make a legacy dial-on-demand routing (DDR) call to another ISDN capable router.  When the DDR connection is successfully made, augment the configuration to specify that only http traffic will bring up the link. In this lab, 2 ISDN routers are required An Adtran Atlas550 ISDN emulator is used to simulate the PSTN switch/ISDN cloud. Cable a network similar to the one in the diagram above. The configuration output used in this lab is produced from Cisco series routers. Any other router used may produce slightly different output. The switch type and spid numbers need to be specified on the routers. a. Use static and default routes instead of dynamic routing, in order to reduce the cost of the dialup connection. To configure a static route, the network address of the network to be reached must be known. The IP address of the next router on the path to this destination must be known as well. b. 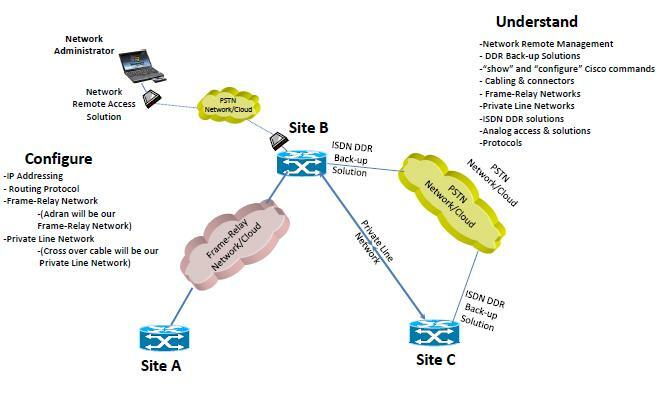 Perform a show IP route to verify routes exist. a. The dial information must specify the remote name of the remote router in the dialer profile. It must also specify the dial string, or phone number, to use to contact the remote device. b. Repeat these commands on Moscow. b. What authentication is being used? c. What are the dialer strings on the Tokyo router? b. Were the pings successful? c. If not troubleshoot the router configuration. d. Use the show dialer command to show us the reason for the call. This information is shown for each channel. e. Which dialer strings are associated with Dialer1? f. What is the last status for dial string 5554000 in the Dialer1 readout? 9. Configure Hamilton so that it can dial London on the s0/1 interface. 10. Since the dial-up link is a low bandwidth connection, it is advisable to disable CDP so it does not waste bandwidth. 11. Configure a dialer map command to map the IP address of the destination router to the telephone number required to connect to it. x- is the last digit of telephone number for the destination end of the dial-up back-up WAN design. Please reference the Adtran Configuration Setting diagram. 12. Check to verify what line the router is associating with the asynchronous serial link. Then, configure the line. On the Hamilton router define “interesting” traffic. Interesting traffic is any IP traffic destined for the London router. 14. Configure a static route from Hamilton to London. This static route will only be used if the link from S0/0 to London’s s0/0 goes down. You would use a default route instead of a routing protocol because the frequent "conversations" of the routing protocol would keep the dial-up link active even if there was no " payload" traffic. 15. Save the Hamilton configuration. B: Explain why we have the number “10” at the end of 2 of the static route statements above. c. Ping from the host on Hamilton to the host on London. The first “ping” will fail but it should activate the Hamilton router to dial the London router. Once connectivity has been established between the routers, execute another ping. This one should be successful. * You would only configure one router to be the dialing router. If both routers were configured to " dail" each other and the primary line went down, both sides would dial simultaneously and each would receive a busy signal. So one side becomes the " dailer" like the hamilton, and ther other side is the ansering party. 1. ISDN Swith type is National ISDN-1, North America. It is configured, on the router, using the keyword basic-ni. 2. There are 9 different switch types are availabe. by # isdn switch-type ? Change the encapsulation type to PPP by typing encapsulation ppp at the interface serial 0/0 configuration mode prompt on both routers.